As part of my ongoing efforts to build an impact case study for the next REF, and to put together another funding application, I’ve been doing some research on local reading groups and book clubs, and perhaps naively have been surprised at the diversity of groups on offer in our locality. To give you a flavour, there are groups for readers who have dementia (and their carers), reading groups for the blind and for autistic teenagers. I’m hoping to be able to connect with some of these groups and see if they use digital platforms at all in their reading or discussions. But it’s also got me thinking about how reading digitally may offer a lifeline for people with a disability or health issue that makes reading print books difficult, or that prevents them from being able to share their reading with others. My partner’s mother has macular degeneration, and is now almost completely reliant on her Ipad and Kindle for reading. A lifelong reader, she reacted in horror when we first showed her the Kindles we’d bought some four or five years ago, but now she is hooked and tells me her local WI is awash with Ipad devotees who share their trials and tribulations with the device. Meanwhile, someone I follow on Twitter recently posted about how she was able to read a novel for the first time in a while using an ereader. I’ve never met her, but she suffers from some kind of condition that affects her manual dexterity and ability to physically cope with a hefty tome. In both these cases, audiobooks may have provided a solution, though I’ve never quite grasped the concept of listening to book myself. But ereading offers another option for lifelong avid readers to extend their reading lives and find ways around the issues that affect their ability to continue with an activity they love. As well as offering a lifeline for people with physical issues of some kind, I’m also interested in how the affordances of the digital may be of benefit to readers in terms of psychological and emotional wellbeing. I’ve written here before about the fact that one of the main motivations for our original study was that we wanted to explore why people go online to discuss their reading, as opposed to joining a local group. We were thinking mainly of our own experiences both as sulky students silently fulminating at the back of the class, and as teachers of literature trying to get class members to open up and talk. In these cases, it may just be introversion, shyness or sheer contrariness that holds people back from participating in discussion. But of course for people with social anxieties or mental health issues, online groups may be a godsend. I haven’t yet come across communities of readers online who are organised according to a condition or disability (I would be very interested to hear if they exist). But one of the attractions of online communities is that you can remain anonymous and to some extent choose how you want to be defined. On my recent travels, I discovered CRILS (Centre for Research into Reading, Literature and Society) based at the University of Liverpool who work in partnership with The Reader Organisation and who have been doing some fascinating work on the relationship between reading and wellbeing. Although one of their aims is to ‘set the world agenda in new technologies and the future of meaning’, I haven’t yet found much research specifically on the digital sphere. Of course for many people the terms ‘digital’ and ‘wellbeing’ are antithetical, but work by network member Sue Thomas amongst others has set out to challenge this notion, and to show that online and virtual worlds can help foster and develop a sense of wellbeing. Ironically, Sue is currently in hospital recovering from a knee op. However, she continues to communicate with the outside world via the wonders of modern technology, and I’m sure that the reading she has access to via her smartphone or tablet is much richer than that offered by the hospital library trolley. All the best Sue for a speedy recovery!! My case is similar to the ones quoted. At 86 I have the dreaded macular, which has claimed one eye and, thanks to regular injections is being kept at bay in the.other. For no known reason, my sight suddenly deteriorated in December but I have a big Audible library, to which I had been subscribing for several years as a form of insurance. My one-eyed sight has been creeping back to my surprise. I gradually found I could read kindles with large fonts selected and have been able to reduce the size to one above normal and also work through newspapers and even most of The Economist. Improvement is continuing with practice. 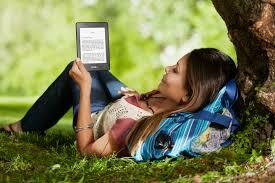 The point is not only do Kindles provide a bridge to the print world, with tablets they are also therapeutic. Down with the naysayers! Hi John, thanks so much for sharing your experience. That is really interesting to hear that you feel ereading provides a kind of workout for your eyes, I haven’t come across that idea before, though of course claims have been made for tablets etc helping with ‘brain training’. Dear all, sorry for being slow to reply. As Bronwen said, I’m a bit laid up at the moment. (Thanks for your best wishes Bronwen!) But I do have a point to make about reading practice. Last year when I had my first knee replacement I signed up for Netflix and watched 3 seasons of House of Cards whilst laying on the sofa with my leg raised on cushions and balancing an icepack on top! What I learned is the the way Netflix works, which is no ads and a 12 second break between episodes, is actually very conducive to deep concentration. The truth is that over the years I’ve found it increasingly difficult to immerse myself in a book as I used to do, especially as a teenager, but Netflix bingeing allowed me to revisit that. When I’d gobbled up H o C, a total of about 40 episodes I think, which I often watched in blocks of 3 (!) I then tried reading a few books, first nonfiction then even a novel, my first for years. It worked. I’d learned how to be immersed again. I know Netflix is hardly cutting edge technology, but I thought you might be interested to hear about my experience, and wonder if anyone else had encountered the same thing? Hi Sue, glad to hear recovery going well. I think the idea that our desire for and ability to be immersed in a work of fiction can carry over from one medium to another is fascinating. I suppose we are used to the idea of films or tv adaptations making us want to read the book (and vice versa) but what you describe here is more about the way in which we consume the text. I had a similar experience over Xmas when I became obsessed by Making a Murderer (on Netflix) and watched about 6 episodes in a day. Of course I could only do that because it was Xmas and I was stuck at home because of bad weather with time on my hands. But like you, my engagement/obsession/addiction(?) made me seek out other long form stories across media. In my case this meant crime, and I spent an enjoyable couple of days reading one of Barbara’s novels – an excellent read I must say, and one of the few crime novels I’ve read that didn’t disappoint with the ending! I have heard some people refer to the Netflixisation (or some such) of the book, and also people sometimes refer to Spotify as another model that might be relevant for understanding reading in the digital age. Very interesting stuff, thanks for sharing, and hope you will be up and about again very soon.